Stay anticipating and welcoming the possibility of an exciting adventure and you will never be in grief in Life. On the other hand, you will be able to feel and be the bliss in each moment. What is a sudden health diagnosis: a cancer or any other debilitating disease? It is an adventure. What is a job loss? An adventure. What is a broken relationship? It’s an adventure. You call something an adventure when it is an experience that you have not been through before. Almost all the time, since you and I were born, we have been encountering Life at its own terms. One surprise after another. But we see it in a linear fashion. We see our Life go through only these stages: from birth to starting school; starting school to finishing school (pre-school to high-school); starting an academic course to qualifying for a college degree; starting a job to starting a family; finishing actively raising a family and caring for children to retiring from a job, starting retirement to reaching death. So, while are essentially flowing with Life, we think we are in control. Surely, a lot of these stages apply to almost anyone who is capable of reading this post now. But if we look deeper, peeling off layer after layer in each stage, we will notice that there have been so many unforeseen events in each stage. The bigger news is also that we have been able to overcome each of them and get to where we are today. So, why this anxiety about Life’s next surprise or adventure? Why the fear of an ‘unknown’ future? The other truth about these stages in Life is that each one begins and each one ends when it must. Much like Life itself. It has begun. So it will end. So, why this fear of death? When you understand that the two dimensions of Life that you worry about the most are the most predictable, you will be able to live intelligently. Consider both dimensions: a. Life will always surprise you in each moment and b. you and everyone you know will eventually die. Haven’t you dealt with both dimensions in some measure already? This means you are capable of living with acceptance of what is and living with insightful action. Know that Life is not trying to victimize you. Life is doing its job. And you must do yours by meeting each situation sportingly. “Security is mostly a superstition. It does not exist in nature, nor do the children of men as a whole experience it. Avoiding danger is no safer in the long run than outright exposure. 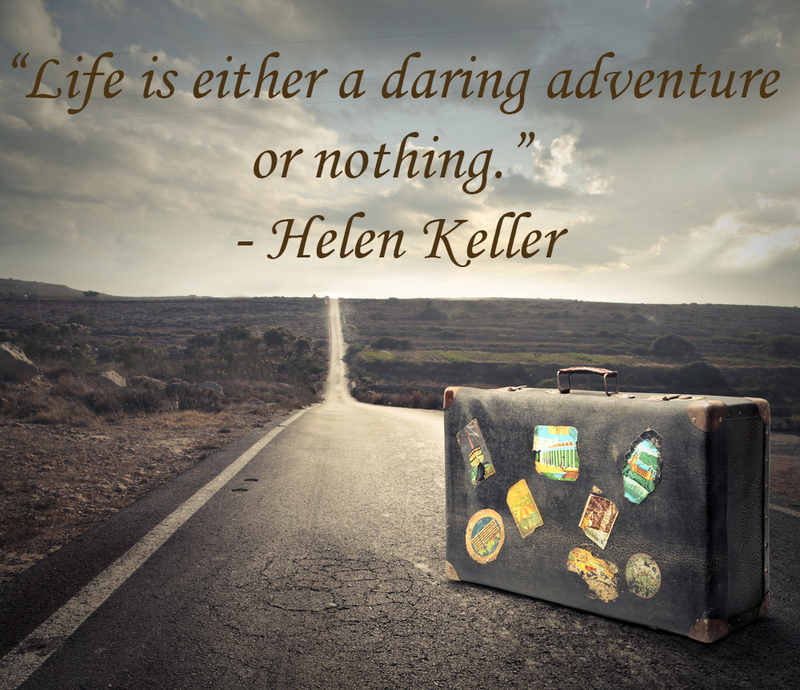 Life is either a daring adventure, or nothing. To keep our faces toward change and behave like free spirits in the presence of fate is strength undefeatable,” wrote Helen Keller (1880 ~ 1968), in 1940, in a poem called ‘Let us have Faith’. Indeed. Don’t expect any more security from Life than what you already have __ which is the fact that you are alive, can read this and have most of your faculties intact. Have the faith that this roller coaster called Life is a non-stop adventure sport that you can enjoy only if you stay happy and stay in the now!